I had the honor of being photographed by one of my mentors, Don Giannatti (Wizwow on flickr) the other day after attending one of his fantastic lighting seminars. He chose to use a beauty dish on me. I love the way beauty dishes look, especially the way it sculpts the edges of my roundish face. 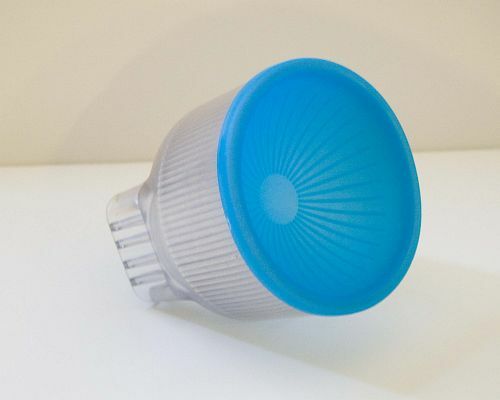 Soft concentrated light which falls off quickly. 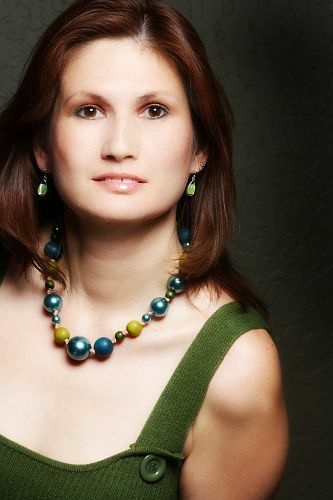 You can learn more about the merits of the beauty dish on Don’s site. Most of my inspiration for lighting setups come from that site and DVD. Anyway, I was so excited when I saw the images I knew I had to come up with something that could recreate the look that was portable and wouldn’t break the bank. Although I am handy with PVC pipes, my ability to use power tools are in question. I was thinking of cutting out a hole in a wok or mixing bowl, but I still couldn’t figure out how to rig it to reflect the concentrated beam back into the dish, plus my lighting stand would probably never stay upright with that kind of weight. Then in a moment of brilliance, if I may say so myself, I came up with the lighting mod you can see at the top of this post. I used a “Fong” type Lambency diffuser that I carry with me in my bag, but you can make a DIY one as listed on here. 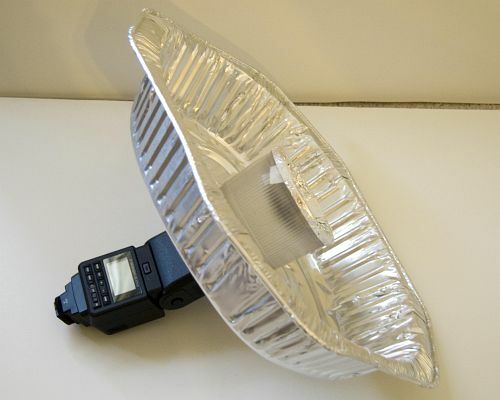 I took the blue “cooling filter” lid that I never use and covered it with foil to reflect the light back. 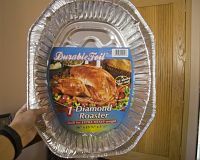 Next I took an inexpensive ($2.99 US) aluminum turkey-roasting pan and cut a hole in the middle to accommodate the base. 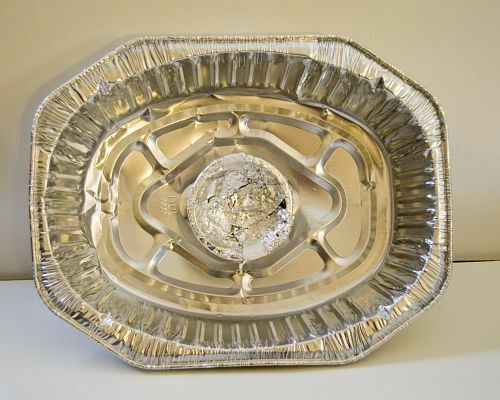 Next place the foil covered lid on. You may need a little duct tape to keep things secured. Attach to the strobe and you are in business! 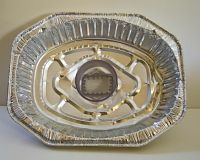 And if you travel by air just take the diffuser with you, go to the grocery store pick up the pan and some foil. No need to lug your equipment, although you may get some odd looks if you are trying to appear professional. Here is my $2.99 dish. I think mine makes me look, well…at least 25 years younger! 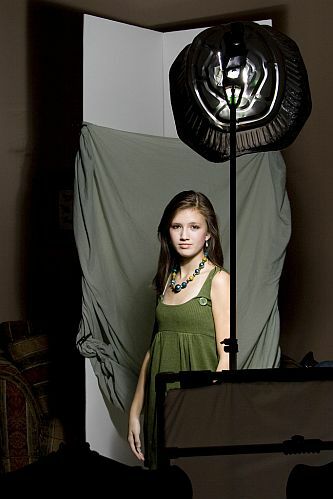 Here is the beauty dish in action. Hope you enjoy!